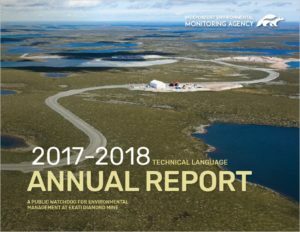 The Independent Environmental Monitoring Agency is a public watchdog for environmental management of Dominion Diamond Ekati ULC’s Ekati Diamond Mine, located approximately 310 km northeast of Yellowknife in the Northwest Territories. The Agency was established under the Environmental Agreement negotiated in 1997 by the company and Indigenous, federal and territorial governments. 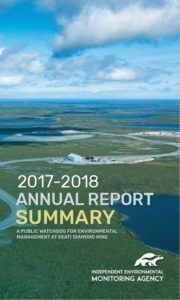 The Environmental Agreement is a legal instrument to ensure Dominion Diamond Ekati ULC, the Government of Canada and the Government of the Northwest Territories respect and protect land, water, wildlife and the land-based way of life essential to the well-being of Indigenous Peoples.